On August 10, 2018 The Big Ten Club lost one of its most loyal and dearly loved members. Howard graduated from Purdue in 1945 with an Electrical Engineering degree and was a member of the All-American Marching Band. 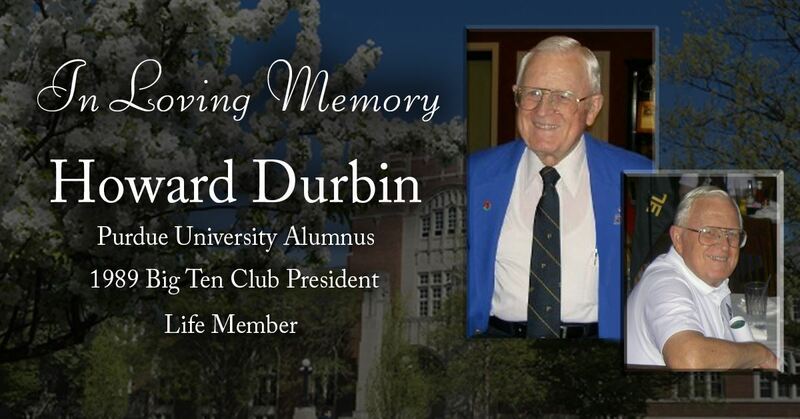 As president of the Purdue Alumni Club of South Bend, president of the Purdue Alumni Club of Los Angeles and president of the Big Ten Club of Southern California, Howard was committed to being of service anywhere he lived or worked. Howard is survived by his three children (Brian, Carol, and Peggy), 4 grandchildren, and 14 great-grandchildren. 12 Noon - funeral at St. James Presbyterian in Tarzana followed by burial at Forest Lawn Hollywood Hills, 3:30 p.m. If you have any photos of Howard at events or when he was president, we are looking for photos to have at the service and add to the website. You can send them to Lisa Winger at illini@winbach.com. To read more about Howard, see other comments or even add your own click the link below to visit our website. We honor our members lost and share our stories about them. "There are certain people who seem to define the Big Ten Club. They give it a character and soul, a deep connection and a strong and solid anchor. Howard Durbin was one of them. Even though you might have only seen him at a few events throughout the year, it was always as if no time had passed between those events. You would simply pick up where you left off. Seeing Howard and shaking his hand gave the Big Ten Club a sense of welcome and home. Howard was a gentle and sweet man. So many of us looked forward to seeing him at a variety of Big Ten Club events, and when he wasn't there, they were just not the same. We all deeply appreciated his invocations (blessings) over many events and meals. And we were all so blessed to know him. Here's to his memory. May it be a blessing for all of us." "When I first joined the officer rotation, Howard pulled me aside and offered me some wisdom on how my #1 focus needs to always be “membership”. I listened, however I know now that I didn't fully understand what he meant. Being part of the BTC provided Howard lifelong friends, experiences and connections he would not have found anywhere else. He recognized and appreciated this and wanted others to benefit just as he did from the club. Today, when I think back on Howard’s advice, I do so with a new appreciation for what he was trying to teach all of us. His words and passion for this organization until the day of his passing will not be forgotten. Howard, you will truly be missed." If you would like to share a few thoughts or memories about Howard, add them here.